Informazione prodotto "AKAI Professional Controller APC20"
The AKAI Professional APC20 Controller is the ideal controller for performers who like to perform in a small amount of space for maximum portability. This device was designed in partnership with Ableton. It’s also perfect for players who want to combine multiple controllers in their setup thanks to its small footprint. Don’t settle for cheap, plastic imitations. From the company whose name is synonymous with the word production, the AKAI Professional APC20 Controller is the serious choice. Akai Professional and Ableton designed the Controller APC20 especially for Ableton Live, so it's not necessary to map its controls to talk to the software. Just connect your laptop to the APC20 via USB and you're ready to make magic. This device is plug-and-play, so you don't need to install drivers. First-time setup is literally three steps: load the included Ableton Live software, plug in and power up the Controller and select the AKAI Professional APC20 as Ableton Live's controller. That's it. No mapping, no setup, no hassles. This Controller comes with Ableton Live Akai Professional APC Edition software, which is fully functional for performance and production. 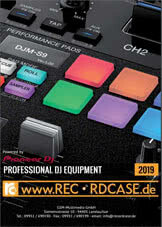 Owners of the standalone edition of Ableton Live 8 can also work seamlessly with the AKAI Professional APC20 Controller. Live 8 has full support for the APC20. The Controller also enables special clip-status views and feedback that only the matrix of the device can display. The matrix is not limited to only 40 clips: you can scroll and shift, enabling you to access, control and perform with an unlimited number of cells. The AKAI Professional APC20 Controller has nine faders, which you can assign to volume control, pan, sends and a choice of three user-mapped modes. You have even more control power with special controls including Tap Tempo, Tempo Nudge, record enables, solo/cues, and two assignable footswitch inputs. A new User Mode enables you to use the Clip Launch buttons to control instruments and the Drum Rack. Sii il primo a scrivere una recensione per: "AKAI Professional Controller APC20"